Pre-heat oven to 180 C for 15 mts. 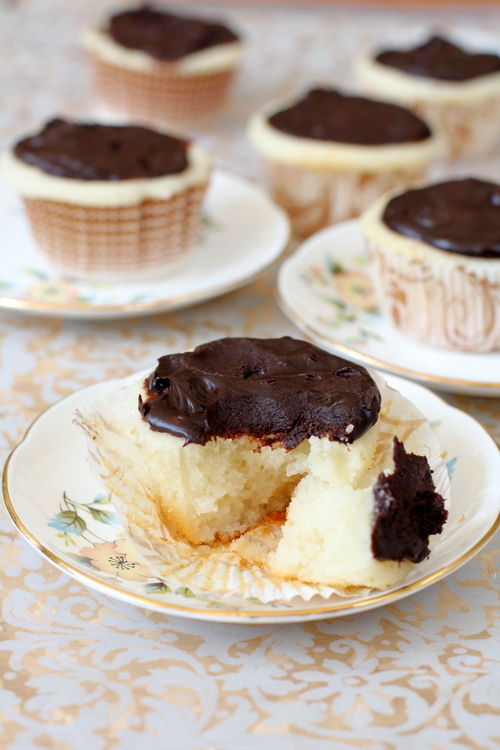 Place cupcake liners in a muffin pan and keep aside. In a bowl, cream the powdered sugar and butter till light and fluffy. In another bowl, mix milk, yogurt and essence. Whisk well for a minute. Pour this milk mixture into the butter-sugar mixer and whisk till well combined. Add the flour and fold into the batter. Do not over beat. Just fold till not trace of flour is found. Pour upto 2/3rd of the batter in each cupcake liner. Bake in pre-heated oven for 18-20 mts. Check from 15 mts onwards. They will not brown too much and will appear white in color after baking..
Place a tooth pick in the center of the cupcake and if it comes out clean, the cupcake is done. Remove from oven and cool for 10-15 mts. To prepare chocolate ganache, place the fresh cream in a stainless steel bowl and heat it over low flame till bubbles appear around the edge of the pot. It should just scald. It usually takes less than a minute or so. Turn off heat. Immediately pour this cream over the chopped chocolate and cover it. Let is sit for 5 mts. After 5 mts, whisk till smooth and leave aside for half an hour. 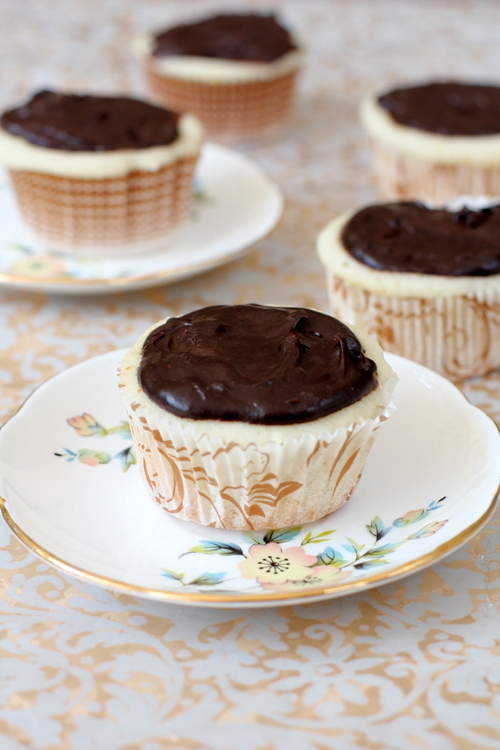 Frost the cupcake with chocolate ganache. Ensure that the butter and yogurt are at room temperature. The milk should be luke warm or slightly more than luke warm. It should not be cold or at room temperature. Do NOT over mix the flour into the wet ingredients. Just lightly fold the flour till you find no trace of flour. The consistency of the cake batter is like a thick dosa/idli batter. Oven temperatures differ from oven to oven. My oven took almost 20 mts to bake the cupcakes. Check from 15 mts onwards. Place the pan in the middle rack of the oven and bake. This batter makes 18 cupcakes (standard size). By Sailu Published: November 15, 2012 Easy to make eggless cupcakes.for kids. 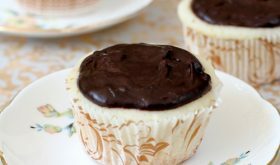 As part of Vegetarian Baking recipes series, here's a basic egg free vanilla cupcake recipe with chocolate ganache. Loved your recipe , easy to try right away, Thanks! The cupcakes came out very fluffy…and your children’s day menu looks very yummy & healthy as well. Can I do exactly same and pour in a pan and make as a plain cake ? If so will it be enough to bake at 180C for 15 – 20 minutes. Pl confirm. Yes, you can make it as a cake. Use a 9″ cake pan. Bake at 180 C for 35-40 mts. It might take a little less or longer time to bake based on your oven. Check from 30 mts onwards. if i dont want to use yogurt then!!! it was really good!! but if i want to make 2 batches do i have to preheat the oven again? There is no need to pre-heat oven if you are going to bake immediately after removing the first batch of cupcakes. tried this today,best gift for my son’s birthday! came out wonderfully thanks a lot. Quick question, can this recipe also be used for making a cake instead of cupcakes? I have tried making eggless cakes 3-4 times now and it is very mushy in the center. Not uncooked just mushy. So wondering if I can try this recipe for cake and not cupcake. my oven doesnt have pre-heat option “i guess”. 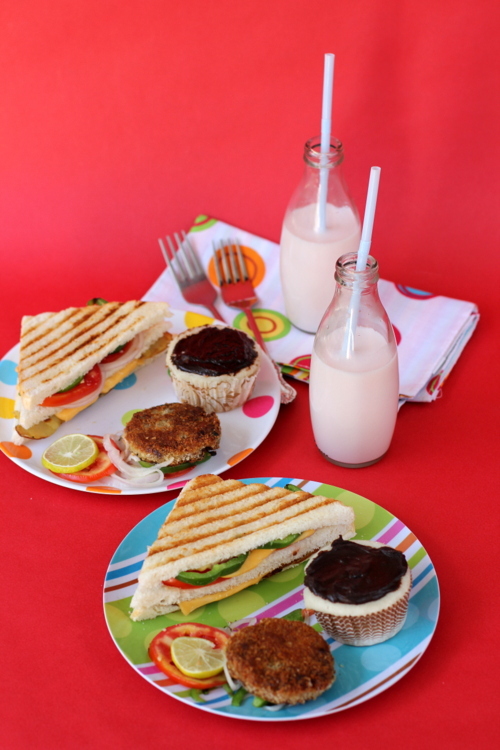 in that case, can i simply put the cup cakes and bake for 15 mts…. will that work ? i have been a great failure at cakes. i want this to work out…. Can someone tell me what a ‘cup’ is? 2 1/2 cups of flour.. what is that in grams? The cake sank. I think the butter should be much lesser. I have had many successes with egg-cakes, this was the first eggless one i tried and it was tasty no doubt, but it was ‘halwa’ not cake. Didn’t rise at all really. Not fluffy. seemed too weighed down with butter. i used 3/4 th cup ( measured 170 g soft butter) as per the instructions, and it did not work. I think 50 g butter would have sufficed. BTW I had another side effect – the top of the cake crusted like a brownie and cracked too. But I blame this on having used a glass pan instead of metal pan. With glass cookware, i believe temperature should be 25 degrees lower and time should be 10 mins or so lesser. Havent got it right yet. 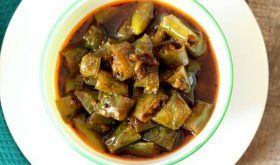 Mam, every recipe of urs comes out vry good for me.. Thanks a lot for sharing…and is there any substitute for yogurt ?? what happens to the baking powder and soda?? Can u please tell me what kind of yoghurt I should be using?? Is it plain or greek?? I’m not sure. Thanks!